That very next day, I met my team. 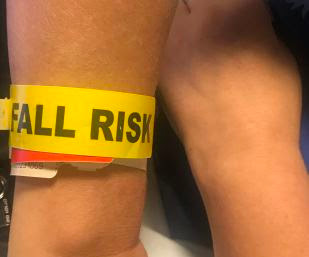 I had two doctors - at least one of whom checked in with me every morning to check me over, update my status and listen to my concerns. I had a physical therapist with cats named after Harry Potter characters to help me walk, an occupational therapist with the world's smartest dog to help me regain use of my hand and arm and a sweetheart of a speech therapist to help me regain my diction and clarity. I had a psychologist with the kindest soul, and a social worker who rode herd on paperwork for my insurance company and located outpatient therapy for me back home for when I returned. I had a nutritionist who talked diet and meal planning and a recreational therapist who invited me to group events. I had a nurse and an aide on every shift, and they were all terrific. Anna and David were making do but it was a lot of stress on Anna. She couldn't hang at her father's house as much due to her part-time job (he lives over an hour away), and her course load of AP-level classes this semester is brutal. She was alone in the house a lot more than I would have liked, but there wasn't a lot of choice, really. David was managing okay once he got used to the new normal. That first week or so I limited our daily contact to texting only. When I said goodbye to the kids the day of the stroke, I wasn't doing too badly. I didn't want to frighten them with how much worse I'd gotten. But we talked and we joked as we texted, and my sister-in-law, neices and nephews all came by to lift my spirits. There's a lot of fatigue early on after a stroke. I'm three weeks down the road now and much better but still tire easily. In those early days, I was mostly confined to the wheelchair, barely able to take a few shuffling steps before my leg crumpled. We spent a lot of time on the exercise cycle and in a special harness suspended from an overhead track often dragging my leg. I'd finish my physical therapy sessions shaking and covered in sweat, napping between my two sessions a day. I told myself every step was a step closer to home. Occupational therapy was harder. My arm and hand were useless and non-responsive. I had to learn to undress, shower, and type one-handed, which is frustrating and incredibly tiring. I was pulling muscles in my back and shoulder from compensating for my dead side, and by the end of the first week, the best I could do was a slight jerking motion of my arm. Speech therapy was going much better. Once again, my theatre degree came in handy. I was doing my old stage warmups from the first day, so there wasn't a lot for my therapist to give me. First we discovered I had some definite weakness in my diaphragm. My speaking voice was rough, and pitched oddly, like I had a cold. My enunciation was pretty good by their standards, but sounded lousy to me. After one of our sessions, I was going through some warmups, tongue-twisters mostly, and realized I didn't have one that featured the letter "m." So I started singing "Mama Mia." I was completely unable to vary my pitch by more than the slightest degree. I sounded tone deaf and no matter how hard I tried, the notes wouldn't come. That was a hard night. I kept telling myself I was still breathing, still going to go home and hug my children. Nobody who loved me would care one bit if I could sing anymore or not. 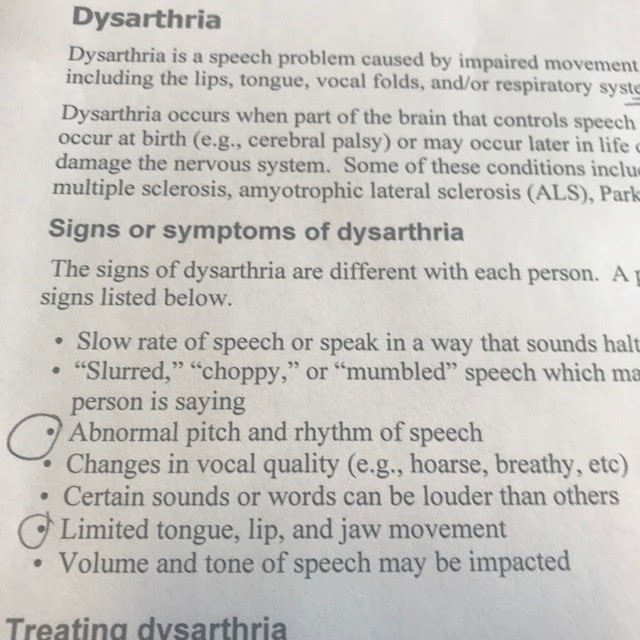 It's a condition called dysarthria, and I may get some function back over time. I might not. I will most likely never have the voice I once had. This one hurts. A lot. I am so sorry. Sending my warmest wishes to you, and praying for a recovery that comes faster than you hoped.